We all love listening to music in the shower. If only there was a way to listen to it better while the shower is running, though. Shower speakers, unlike regular mp3 players, are waterproof and mountable inside the shower. You can comfortably sing along without having to worry about the water damaging the device or distorting the sound with one of these gadgets. 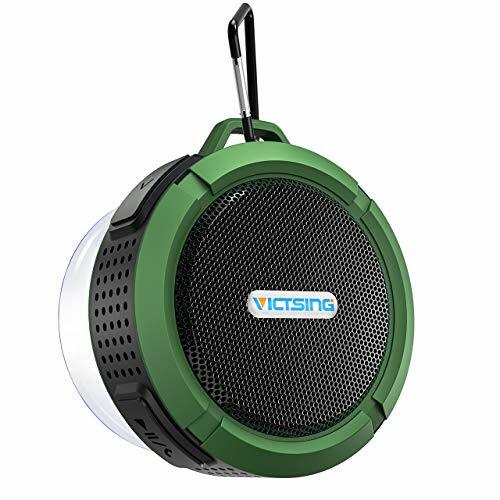 The Victsing shower speaker is a little round thing with a remarkable amount of power and functionality. The speaker is encased in a silicone cover with water resistance up to IPX4. The case also makes the speaker both dustproof and shockproof. It comes with a suction cup to attach the speaker to the bathroom wall. There’s an additional alloy metal hook to prevent accidental falls just in case. The suction cup is detachable. You can remove it for cleaning if needed. The manufacturer doesn’t recommend immersing the speaker in the water, however. It can withstand a lot of splashes though. You can drop this shower speaker in the tub, fish it out, and it would still continue to play music. The 5W speaker supports A2DP sound. What does that mean? This speaker will blast out a crystal clear stereo sound. You will not have any trouble listening to it while the water is running. The speaker has built-in Bluetooth to stream audio hassle-free from your phone, computer, or another music player. The speaker is powered by a built-in rechargeable battery. The battery can support up to 6 hours of non-stop music playtime. The speaker, unfortunately, synchronizes only with a single device at a time. But that’s not too bad for the price. The suction cup could work better. The speaker is a bit too heavy for it. The SoundBot shower speaker is round and as cute as a button. It’s also super cheap. Despite its size, this shower speaker offers excellent sound. It’s decently loud and comes with some noise reduction capabilities. The speaker is equipped with full-spectrum coverage of audio. The shower speaker is water-resistant. It’s not completely waterproof but can withstand some water splashing. Unlike the other shower speakers on this list, this one should not be kept too close to tubs or swimming pools. The speaker has to be carefully installed to make sure it won’t be doused in water when in use. This SoundBot has a decent battery that can ensure over 6 hours of battery life. It also enables over 6 hours of hands-free talking. The speaker takes a very long time to recharge. That’s inconvenient and frustrating at times. It connects to Bluetooth quickly and easily. The speaker can connect to any single Bluetooth-enabled device at a given time. The SoundBot is also surprisingly well-built. It has a suction cup in the back to connect to the bathroom wall. The suction cup is too small to hold the weight of the speaker. It requires second type of mounting. It syncs with multiple devices. That’s right; you can connect this shower speaker to more than one device using Bluetooth. For example, you can connect the speaker to your music player and phone to listen to music and take phone calls while in the shower. This speaker is really loud. However, don’t expect superior, high-end sound. The audio it delivers is similar to audio on a phone left without extra speakers. There is no thumping bass or high range treble, however. This can stick to the wall very well using the suction cup. But it detaches naturally, so you will have to check the suction every once in a while. The durability is impressive given that this speaker has a slew of certifications, including FCC, ROH, and CE. This speaker is 100% waterproof. The speaker can even be submerged in water up to 3 feet deep. The long battery life. The battery can last 10 hours, which means days of playback without extra charging. The main feature that set shower speakers apart is the type of Bluetooth version each utilizes to sync with your phone or music player. Bluetooth versions go from 1.0 to 4.0. Safe to say, Bluetooth 1.0 devices don’t really exist anymore. You will come across shower speakers ranging from Bluetooth 2.1 to 4.0. Bluetooth has a feature called Enhanced Data Rate, or EDR, from 2.1 onwards. EDR facilitates quality streaming. It also ensures better data transfer rates and great sound. Don’t be too enthusiastic about buying a Bluetooth 4.0 shower speaker. This version only has updates for things like facilitating data collection from devices like fitness trackers. In other words, buying a Bluetooth 4.0 shower speaker won’t necessarily mean you have a higher quality gadget. A shower speaker with Bluetooth would allow you to connect to a number of other Bluetooth-enabled devices. But how many devices can you connect to at once? Obviously, if you can sync your smartphone to multiple devices, that would be super convenient. Some shower speakers, however, connect only to a single device at once. A shower speaker with just a speakerphone allows music playback. But with a built-in mic, you can take phone calls in the shower. Do look for how long the battery would last on a single charge. You would ideally want a battery that can last up to 6 hours or more. Charging a shower speaker all the time can be a hassle. So make sure there’s decent battery life. The most important spec you need to look for in the end is waterproofing ability. Shower speakers can range from being merely water-resistant to waterproof. Look carefully for the waterproofing standard on the shower speaker. Depending on the standard, the device can be merely able to withstand some splashing or be submersible in water. Don’t assume that a “waterproof” label means you can drop the speaker in the tub. The meaning of the label can vary depending on the waterproofing standard. 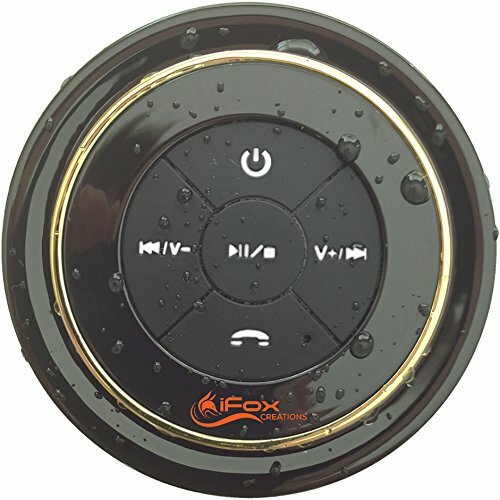 Ideally, you would want at least an IPX7 shower speaker that can be immersed in shallow water for up to 30 minutes. A highly portable shower speaker would be great not just for the shower, but for other activities like camping, hiking, or room-to-room use as well. Most shower speakers have suction cup support, which is subpar most of the time. For the best support, get a shower speaker with a metal hook in addition to the suction cup. Don’t expect shower speakers to have great sound like other digital speakers with subwoofers and bass. These devices are small and deliver sound quality akin to a phone. Look for a shower speaker with a great color to match or add to the existing bathroom décor. Water resistance, mounting ability, playback time. 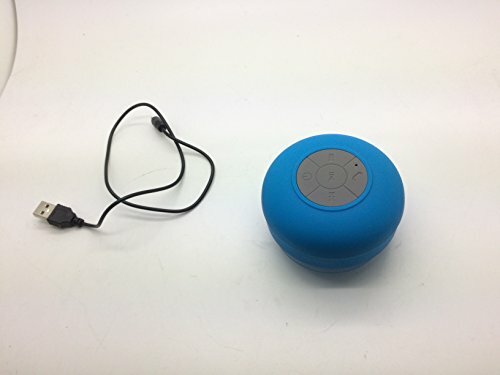 A highly waterproof shower speaker that can be installed easily to the shower stall and which also plays music for hours on end would be money well spent. Avoid the common traps when buying, such as paying extra for devices with Bluetooth 4.0. As long as the Bluetooth standard is 2.1 or above, it should be fine.